In the crisp, morning hours, the police are called to a suspected murder at a farm outside a small English village. A beautiful young woman has been found dead, blood all over the cottage she lives in. At the same time, police respond to a reported female suicide, where a car has fallen into a local quarry. An unsettling and compulsively readable novel that will keep you gripped until the very last page. More than anything else, I wanted to write a novel that included some realistic source documents alongside the narrative. 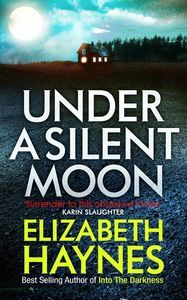 Under a Silent Moon does that: it’s a police procedural, with a Major Crime team investigating two unexplained deaths; but as well as the story, told by various people involved in the case, the book has witness statements, emails, forensic reports and analysis documents and charts, the idea being that the reader has access to everything they need to solve the crime alongside the investigators. For those who enjoy flicking through a book and seeing diagrams, forms and other interesting diversions, there are clues to be had if you know where to look. And yet the book can be read just as well without paying too much attention to the extra content.